Plot plan development in a project goes through several important phases and requires interface between several disciplines to achieve an optimum layout. The first phase normally involves developing the initial overall plot plan or site master plan. At this stage there are not enough details available to develop a detailed plot plan. At the inception of the project, the development of plot plan should follow the principles of Inherently Safer Design (ISD) to provide maximum safety to plant, personnel and environment for the day to day operation and maintenance during the life cycle of the project. Inherently Safer Design has become a requirement in companies that understand that inherently safer plants have lower lifetime costs and therefore are more profitable.The consequences of not complying to these principles are that the resulting risk is required to be managed throughout the design life of the facility. Thus, an Inherently Safer Design is one that avoids Hazards instead of controlling them, particularly by segregation of hazards from non-hazards, segregation of high hazards from low hazards, reducing the amount of hazardous material and the number of hazardous operations in the plant. 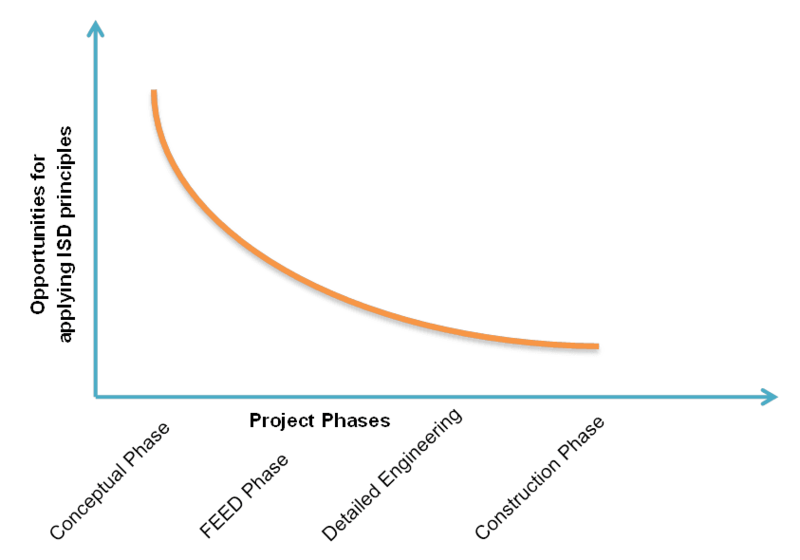 As the project progresses through the subsequent phases, the modification to the plot plan has larger implications on the project cost and schedule. Fewer Hazards: Reduced hydrocarbon or other hazardous material can reduce the consequences of leak. Reduced inventories also bring in reduction of costs due to smaller sizes of storage and handling facilities. Reduced Severity: Safety risk levels for onsite personnel are tolerable and As Low as Reasonably Practicable. Also safety and environmental risk levels for adjacent facilities and communities are tolerable and As Low as Reasonably Practicable. Fewer Consequences: Minimize loss of production as a result of assets damaged or destroyed during a fire or explosion event. The underlying objective of applying the Inherently Safer Design (ISD) principles in plant design is to eliminate or reduce hazards and obviate the need for elaborate safety systems and administrative controls. If principles of Inherently Safer Design (ISD) in plant design are not implemented the outcome will translate into greater reliance on engineered and procedural controls to manage and mitigate the residual risks. Facilitate safe access to plant personnel for normal operation and maintenance of plant and facilities. Minimize the likelihood of a plant unit getting exposed to fire and explosion hazard from adjacent facilities involved in a fire. Permit safe access for fire-fighting and emergency evacuation. Permit safe access to critical emergency facilities to carry out an emergency shutdown operation in the event of a fire or explosion. Must comply with national, state and local codes and safety regulations. Must provide a cost effective layout. In determining the minimum separation distance, consequence modelling of potential hazardous material releases shall be used to determine the risk to plant, environment and people. Site utility services are normally grouped together and are located in a non-hazardous areas to ensure that essential utility services can be maintained under emergency conditions. This requires that firewater pumps shall be maintained at adequate distances from process plants, storage and loading areas to minimize the risk of fire and explosion damage to the firewater pumps. Natural ventilation should be used where possible to eliminate the likelihood of formation of explosive gas mixtures. For example on offshore platforms gratings are preferred over plating because gratings will promote natural ventilation. Location and orientation of equipment's should allow natural ventilation to occur. Dead pockets should be eliminated as they increase the likelihood of explosive gas accumulation. Principles of Inherently Safer Design require that very large hydrocarbon inventories or hazardous chemicals be located away from normal plant operation. Where this is not achievable due to constraints in the plot plan, consideration must be given to risk reduction measures such as deluge system, remote emergency shutdown, passive fire protection, blast protection. Flares are potential sources of thermal radiation, ignition and vapour cloud and hence should be located away from process facilities, storage areas, utility areas and administrative buildings. The preferred location of flare winds is cross-wind direction relative to the prevailing wind direction in the plant. 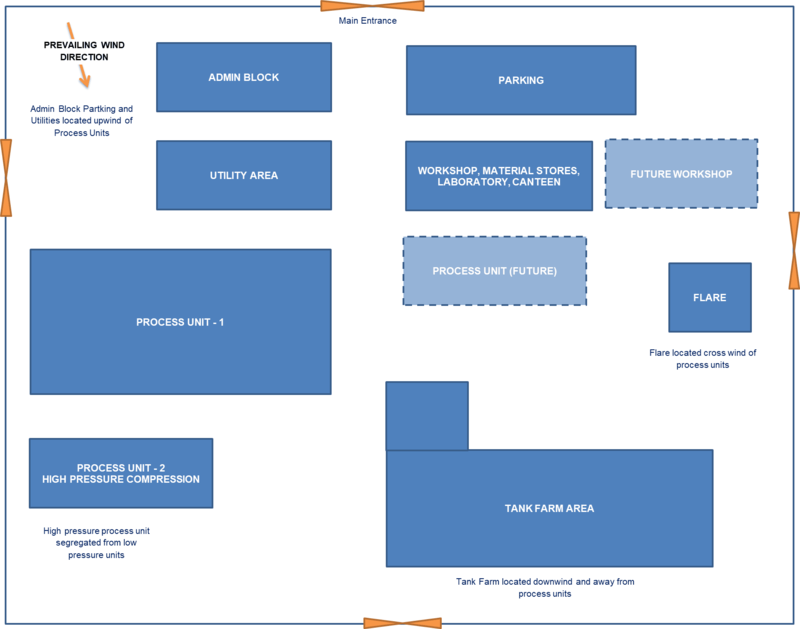 Below is an illustration of a typical site plan. The following criteria are used in establishing the relative the relative location of plant units. Buildings: Locate at periphery and upwind or crosswind of Process facilities. Process Area: Locate in a flat area with good load bearing soil, central area, downwind or crosswind of Utility area and Buildings. Utility Area: Locate adjacent to Process area, upwind or crosswind of process area and higher elevation than Tank Farm Area. Tank Farm: Locate adjacent to Process and Utility areas, downwind and at lower elevation than Process and Utility Areas. Flare: Locate in corner of site, remote from all other facilities, downwind or crosswind of high personnel traffic areas, higher elevation than Tank Farm.